I am a Yoruba woman with an Igbo look, dressed in Edo outfit, with a heart for Hausa language! I am a full breed Naija representing many cultures, Tribes and tongues with my music, lyrics, outfit and my personality! I am thankful for my igbo friends who have decided to honor me with a beautiful igbo name #chiamaka! I love the name and especially the meaning. 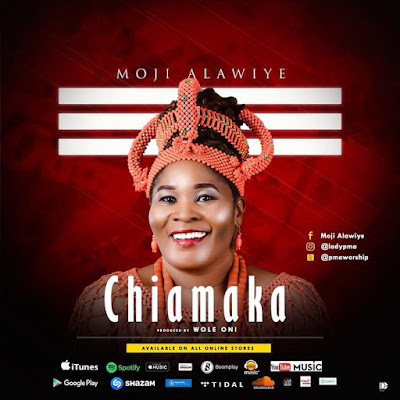 Chiamaka is a simple sing along praise and worship song suitable for all gatherings, especially the Church. In this amazing music, you will enjoy a display of Gods praise as other popular Igbo names are weaved together talking about God’s goodness, blessings, and faithfulness to humanity. Thank you Wole Oni for working on this music! You are truly blessed, My Music Man ! Get the song and be Inspired! Pastor Moji Alawiye fondly called PMA is a worship Pastor, conference speaker, a foremost gospel music minister in Nigeria whose ministry has spread to Europe, United Kingdom, and North America. CEO, Mammusic world, Creator worship experience live in Nigeria, President worship experience live USA Inc. An author, songwriter, and TV personality. Moji Alawiye is an anointed Praise worship leader. Her songwriting skill blended with her spirit-filled prophetic worship ministrations has endeared her to so many people. Trained over a thousand worship leaders in praise worship, songwriting and leadership courses. A mentor and counselor to the youth and young families.